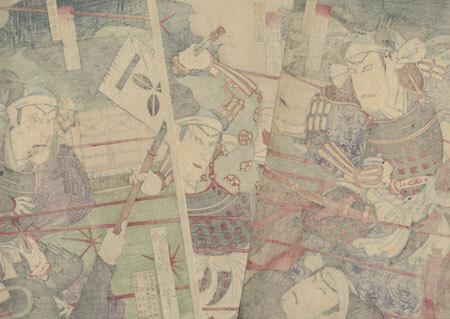 Comments - Dramatic scene of samurai in a heated battle outside a mansion with shots streaking across the night sky. 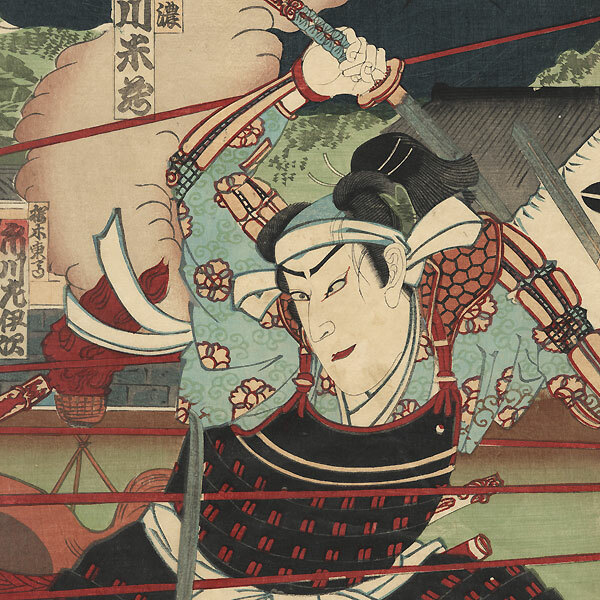 In the center a young warrior raises his sword above his head with one hand while simultaneously grabbing a spear thrust at him by an attacker. A warrior on horseback at left lifts his weapon as he gallops up, staring over his shoulder with a frown. The men wear fine suits of armor and have white sashes tied around their foreheads. The entrance gate to the palace can be seen at right, while a fire blazes on a tripod in the center, sending a cloud of smoke up into the night sky. Detailed with burnishing on some of the black areas. A fantastic action scene. Condition - This print with excellent detail as shown. Three separate panels. Slight paper remnants on reverse at top edge from previous mounting. A few small holes, repaired. Slight toning and soiling, a few creases and stains. Please see photos for details.